The RAM-HOL-UN9URAM X-GRIPIII Universal Cradle for Large Tablets from the RAM iPad & Tablet Mounts range is made of expandable grip arms, a composite spring-loaded cradle, and an extra bottom support keeper, as well as easily-accessible grip knobs that let the user remove the tablet quickly. 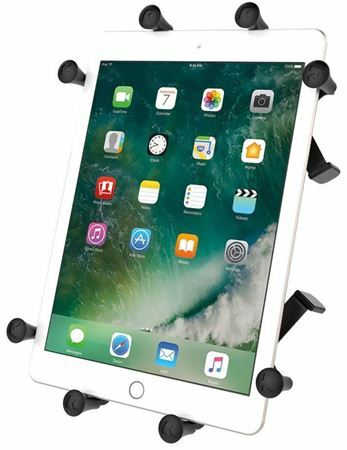 The RAM Mounts Universal Cradle is perfectly fitted for 10” tablets (sleeved or unsleeved) and other smaller sized tablets. This product contracts and expands to fit whatever tablet you have close to the recommend dimensions.